It’s best to understand Japan in numbers: 6,852 islands, of which only 430 are inhabited, by a population of 127 million (nearly twice the population of the UK). Only then can you really begin to appreciate the intense evolution of fads, fashions and foods that have been crammed into every minute living space like a complex jigsaw puzzle. Talking robots walk alongside traditional geisha and high-speed trains whizz past paddy fields. While there is a charming shabbiness to some areas with telephone wires dangling from buildings, you’ll also bear witness to some of the most efficient ablution systems in the world; lavatories automatically wash, dry, flush and play music for tentative users. 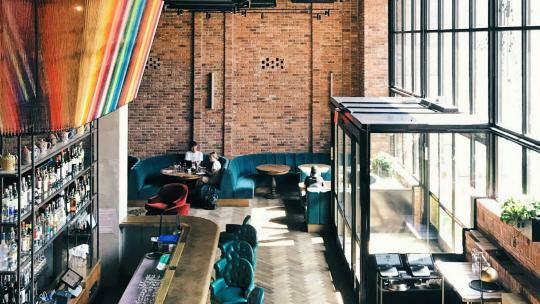 Each city simultaneously encompasses retro design and architecture, a fascinatingly rich cultural heritage as well as brash bars and neon lights. It’s a wondrous place of kitsch – lace doilies and net curtains decorate homes, and dogs wearing baby clothes are pushed along in prams. 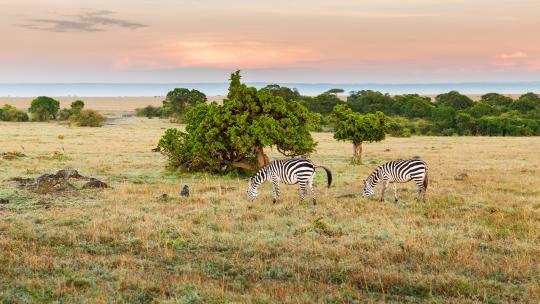 But there is also a calming serenity to the breathtaking natural views and romantic wooden temples. Some say it’s a love or hate relationship, but with such a humble, gracious people you’ll be won over in an instant. It’s nigh-on impossible to fit all this into one trip, but a 10-day tour of Honshu, Japan’s biggest island, is a good place to start. 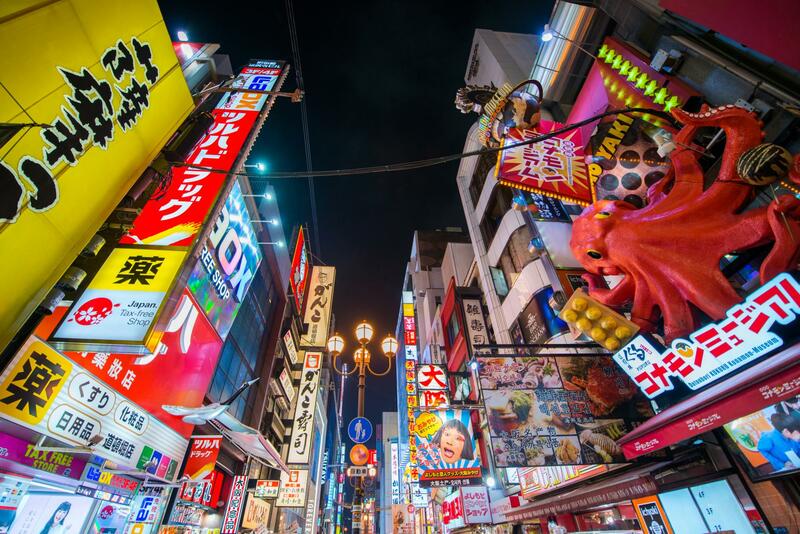 There aren’t any non-stop flights from London to Osaka, but the best value for time seems to be Finnair, which flies from Heathrow to Helsinki in about three hours and then on to Kansai International Airport in nine and a half. Osaka is a great introduction to the mad metropolitan ways of Japan. Spend the evening walking down Shinsaibashi-suji, the main shopping street, and you’ll discover curious displays of plastic food advertising restaurant fare; pet shops with cutesy miniature cats and dogs; high-pitched jingles springing out of shops; and giant moving octopus tentacles and crab claws on the side of buildings. People-watching alone provides hours of entertainment. Okonomiyaki is the city’s pride and joy – a sort of pancake-style mishmash of batter, shrimp, pork and cabbage topped with a rich brown sauce. Pull up a chair – and a bottle of Kirin beer – with locals at Hozenji-yokocho yakizen restaurant and get front row seats at the small galley kitchen to watch the chefs sweat up a storm. Stay: Swissôtel Nankai Osaka, located above Namba station, provides easy access to the city. 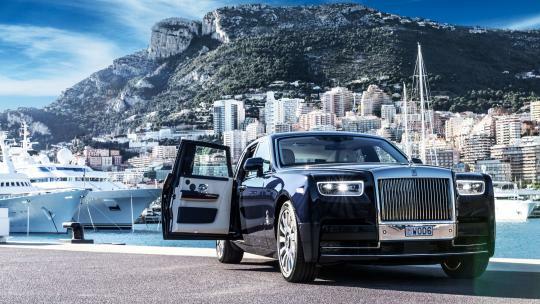 It’s worth paying extra for access to the executive lounge. Buy a rail pass online within 90 days of your trip to access the majority of lines across Japan (for more information visit seejapan.co.uk). The best part about the high-speed and systematically punctual trains is watching the efficient team of cleaners bow passengers off and then charge on board to change headrest covers and swivel seats around to face the correct direction of travel. From Osaka, in under two hours you’ll be walking the spacious streets of Hiroshima. Hardly any signs are written in English, so the best way to get around is with Google Maps. A commercial city, it’s not the prettiest of Japan’s attractions, but most people aren’t here for relaxation. 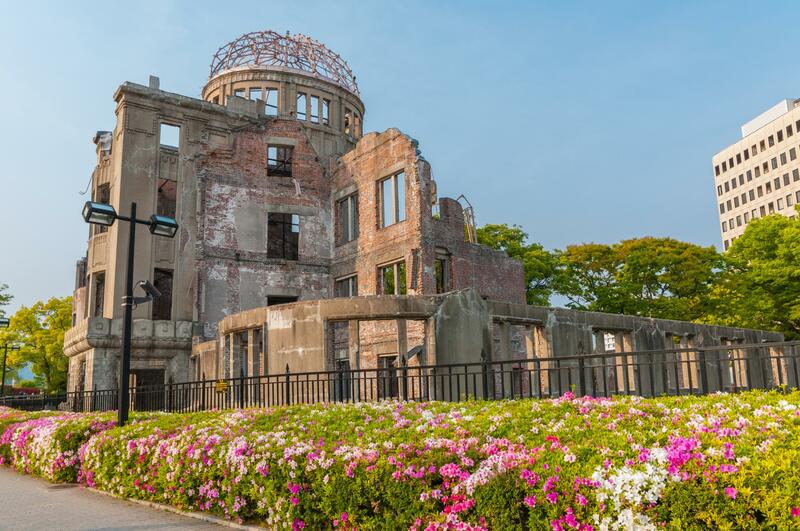 The Hiroshima Peace Memorial details the effects of the atomic bomb that was dropped by the US at the end of the Second World War. Exhibits reveal the devastating aftermath of the blast which led to serious burns, radiation sickness and cancer. Groups of school children can be seen crafting reams of origami in rememberance of Sadako Sasaki, a little girl who attempted to make 1,000 paper cranes before her death, after she was diagnosed with leukemia 10 years after the explosion. You can also see the skeleton of a conference building that was at the centre of the destruction, a constant reminder of the atrocities. Stay: Ana Crowne Plaza Hiroshima is designed more for business trips and meetings than indulgence, but is handily positioned for tourists. For some light relief from Hiroshima, take a day trip to Miyajima. 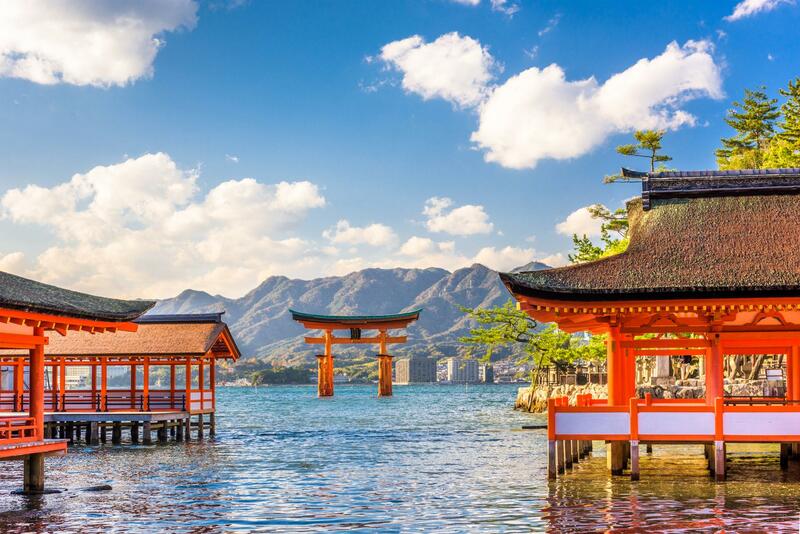 Regarded as the ‘Island of Gods’, it is home to the World Heritage site of Itsukushima Shrine, best known for its floating orange gate. Hike or take the cable car up to Mount Misen and meander through the Virgin Forest watching out for the overly confident deer. An astounding vista over the azure Seto Inland Sea awaits you at the top. Among the many temples to see, be sure to stop at Yumi Katsura’s love sanctuary to pray for ‘magical encounters’ and ‘blissful marriages’. Tiny stone Jizo statues line the pathways that are decorated with hats and glasses by parents who have lost children. Back at the bottom, order a large plate of slimy oysters (they go for size over substance), followed by a much more rewarding momiji manjyu, a maple leaf-shaped pastry filled with sweet red bean paste. 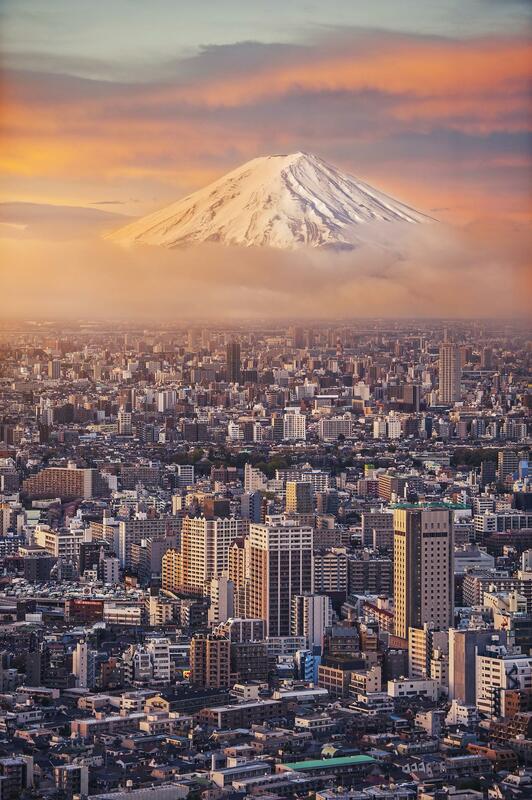 The Imperial capital for more than 1,000 years, this dignified city maintains its status as Japan’s cultural centre. Leafy suburbs make walking around temples a pleasure, although choosing which of the 1,600-plus to visit can be challenging. A walk – or short bus ride – between Ninna-ji, Ryoan-ji and Kinkaku-ji to the west provides a light introduction to the different types of temple, from a peaceful Buddhist residence, to stark white stone zen garden, to ornate Golden Pavilion. Further east, get wrapped up in a kimono and wooden clogs at the Nishijin Textile Centre, then take a long walk through the Imperial Palace gardens towards Kawaramachi station. The grid of streets is easy to navigate and you’ll stumble across a haven of trendy stores selling modern homeware alongside intricately painted Japanese pottery. Pass through Nishiki Market to see all manner of edible sea creatures, from giant sea cucumbers to octopus heads stuffed with boiled eggs. Though you might want to save your appetite for a rooftop izakaya (a Japanese ‘pub’) by Shijo-dori bridge. 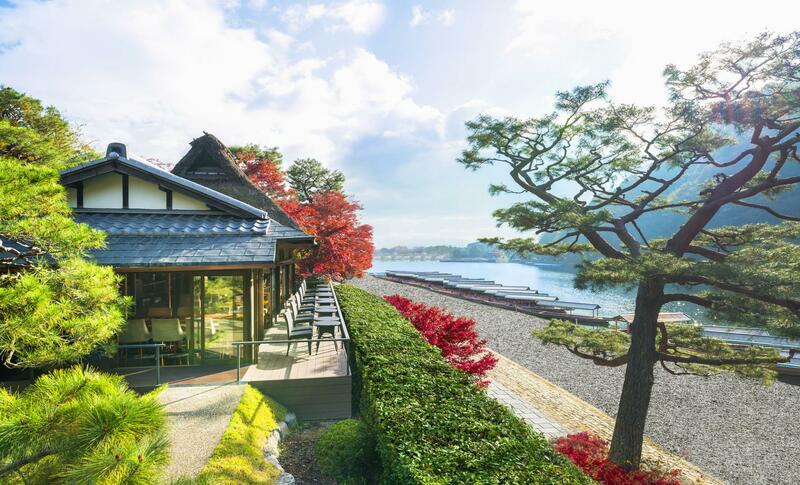 Slurp through a kaiseki lunch of dainty dishes, including tempura and unidentifiable pickled vegetables, while you kneel on a tatami mat overlooking the river. Save the traditional Gion neighbourhood for nighttime when it is more lively and you might spot a geisha at dusk. 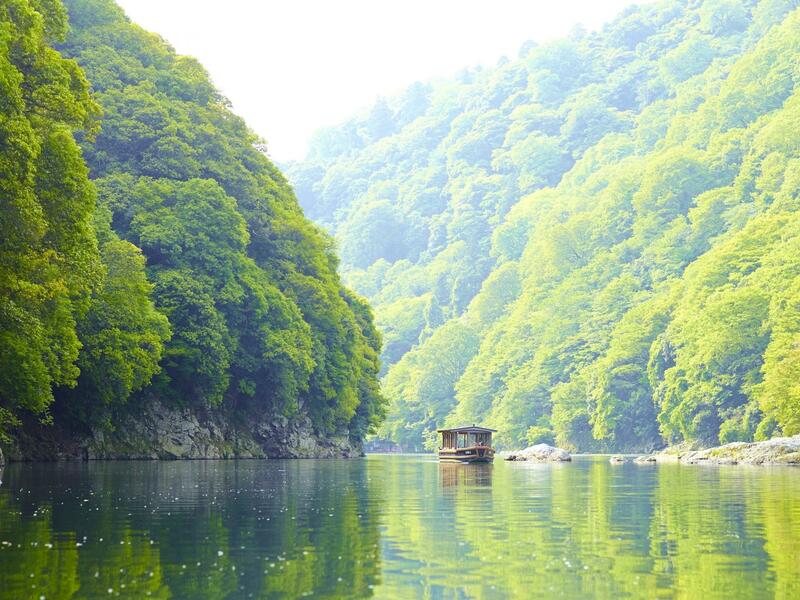 Arashiyama is also a must-see: be transported to the countryside with the calming waters of the impressive Katsura River and nearby bamboo forest. 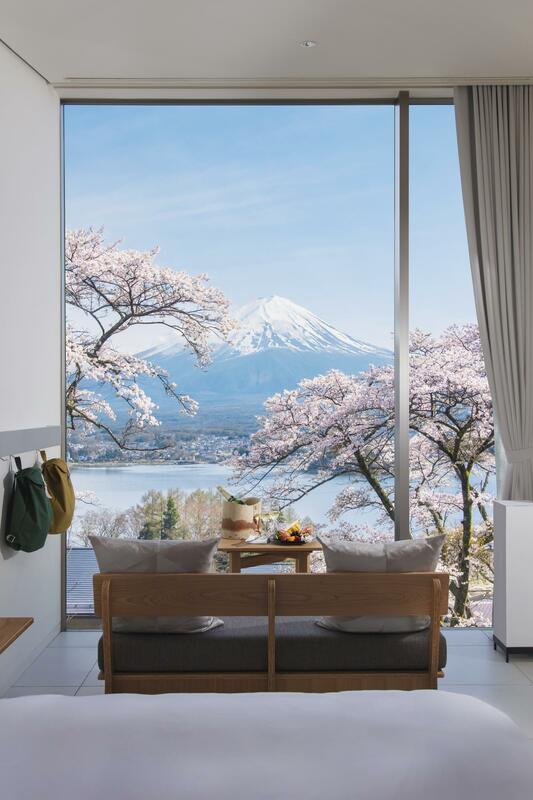 Stay: For a ryokan experience (a traditional Japanese inn with tatami floors and futon beds), check into Hoshinoya Kyoto. Staff pick you up by boat and take you to a secluded hotel built into the forest, complete with incense-making and menus from executive chef Ichiro Kubota of the Michelin-starred Umu restaurant back in London. On the other side of the river is Suiran, a Luxury Collection Hotel, for less fuss and easy access. Book a room with a private onsen – the perfect way to unwind after a long day of sightseeing. 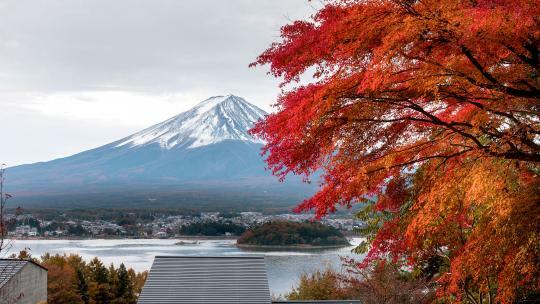 A visit to Japan is only complete when you’ve laid eyes on Mount Fuji, best done from one of the surrounding five lakes. Lake Kawaguchi is perhaps the most famous, although the attractions around the edge of the waters are a tad parochial. 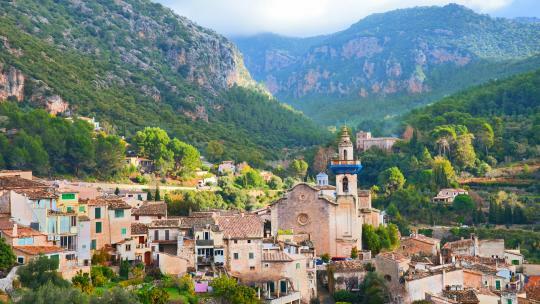 There’s the all-singing and dancing Music Forest, the dubious-sounding Monkey Theatre (literally theatre by monkeys), a quaint art museum and a selection of twee cafés. To really make the most of Fuji, pull on your hiking boots for a walk around the lake or up the sacred volcano – it last erupted in 1707. Ideally, coincide your trip with one of the many local festivals, whether that’s the Shibazakura Festival in April and May, which sees a vibrant blanket of bright pink phlox moss appear, or the Fireworks Festival in August. Where to begin? Really, the colourful capital requires its own 10 days for exploration. But when time is limited make sure you tick off the essentials: a trip up the Skytree observation tower to fully comprehend the startling expanse of buildings; karaoke; temples; a drink in a tachinomi – a stand-up bar solely frequented by businessmen; dinner at a kaitenzushi, a conveyor-belt sushi restaurant where you order food on a screen and the arrival of plates is announced by a little celebratory tune – try the favoured Kappa Sushi chain for reliability. If all else fails, wandering the streets will provide amusement enough.